Lake Parramatta Reserve is one of Sydney’s top attractions; an expansive 73-hectare reserve located ten minutes away from Parramatta and half an hour from the city’s CBD. It is actually the largest bushland in the area, and is recognized as one of the most beautiful places in Western Sydney. Lake Parramatta is a man-made reservoir that was created following the damming of Hunts Creek in the 1850s. In the last century, it had remained closed to the general public due to water safety concerns. It has since been opened in 2015 and is a charming location for a host of recreational activities. Hiking is one of the most popular activities at this park. If you are looking for a trip that offers a great day out in the natural outdoors, look no further than this reserve. There are three marked bush walking trails for you to choose from. These include the Banksia Trail, the Lake Circuit, as well as the She-Oak Track. For experienced bush walkers, the full Lake Circuit trail covers the entire region around the lake. providing the perfect opportunity to marvel at the wildlife that calls this reserve home. There are many native bird species, so lookout for the cockatoos, kookaburras and rosellas. Along your bushwalk you also may spot frogs and lizards to compliment your journey. The other two walking trails are shorter and are a better option for those who would like a gentler walk. The She-Oak Track is an easy 1500 metres long trail that begins on the lake’s shore and takes the path filled with many She-Oak trees, hence the name. The Banksia Trail is ideal for sightseeing as it offers amazing views and is filled with Banksia trees. 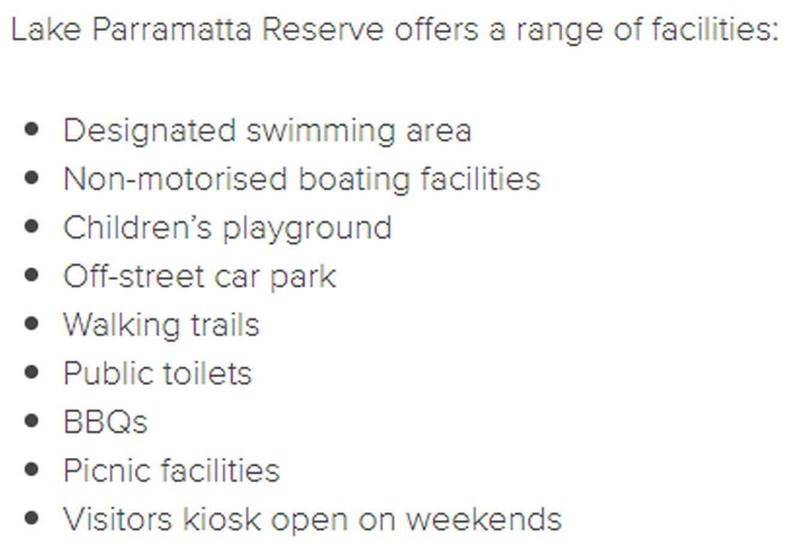 Other popular recreational activities at Lake Parramatta Reserve include swimming, boating and fishing. Amenities provided are picnic tables, BBQs and public toilets. There is also a visitors’ kiosk on location from where you can get refreshments on weekends. Off street parking is also available. Lake Parramatta Reserve is easily accessible using 28 Bourke Street in North Parramatta.